Naming the troupe "Succession" delivers Cheng's idea of passing on the traditional performing art of percussion through generations and to keep it alive in modern life. As the first professional percussion group established in southern Taiwan, Succession Percussion Group takes inspiration from traditional culture and combines it with modern repertoire to develop new forms of percussion performance. The troupe has been selected as an outstanding performance group of Kaohsiung for three consecutive years and is supported by the Ministry of Culture. Founder Cheng Li-feng, who had studied in Paris, founded the percussion group in Kaohsiung after seeing the city's lack of percussion programs upon returning to Taiwan. He recruited young percussionists, who were fourteen in average age, and prepared them to become a new force for promoting music and art in southern Taiwan. With rich experience in traditional Chinese percussion, drumming, and ethnic music, as well as contemporary French theater, Cheng integrates percussion with electronic music, theater, dance, and traditional Chinese poetry and calligraphy to create performances that embody traditional and contemporary characteristics. The group's 2009 production, "Leader of the Parade (陣頭樂響)," for example, reinterprets traditional Taiwanese drumming and dances performed at temple fairs by incorporating black box theater with sound and lighting technology and contemporary Western music. Other productions, including "RAP Hip Hop Percussion (RAP 嘻哈擊)," "The Nine Songs (九歌)," and "When Soldiers Meet Carmen (當士兵遇見卡門)," integrate rap music, traditional Chinese culture, classic poetry, and orchestra, as well as glove puppetry and shadow marionettes, to offer diverse visual and sound experiences. 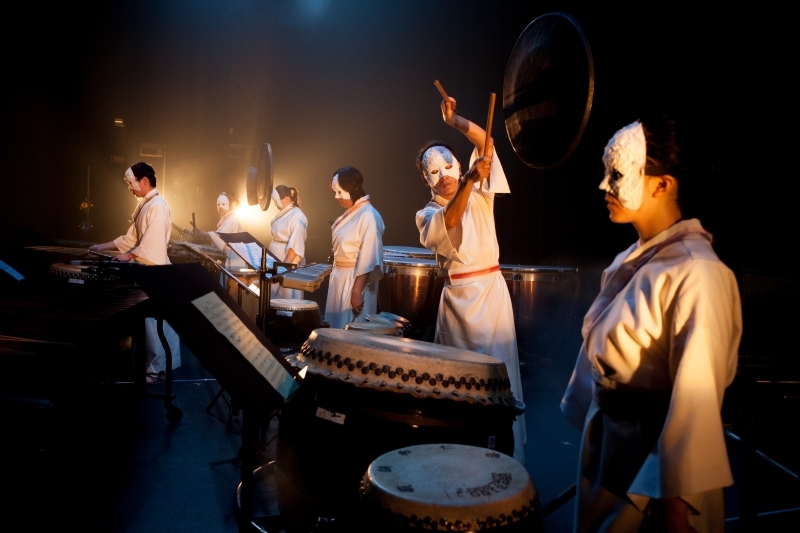 In 2011, the troupe was invited by the Krakow International Percussion Festival in Poland to perform "Quest of the Light and Darkness (明暗之間)," a theatrical percussion production that integrates sound, light, and shadow to interpret original music composed by Cheng. Its participation in the international festival has brought them more global performance opportunities later on. In addition to developing and promoting percussion repertoires, the troupe has formed Dynamic Percussion Group (岱拿米卡打擊樂團), Southern Music Ensemble (南音樂集), and NEO Chamber Ensemble (NEO室內樂團) to cultivate younger percussionists and provide a platform for modern music composers as well as music students in southern Taiwan to debut and perform their musical works. Since its establishment, the troupe has developed into a leading percussion group that enriches the music scene in southern Taiwan. It also partners with local communities, schools, and other performance groups to promote music education and enhance the public’s appreciation for percussion shows to create greater artistic value for music creators. Visitors Today:153. All Time Visitors:1,229,960.